Provided you live in a hospitable climate, there’s nothing like adding a palm tree to the home landscape to evoke sun-filled days followed by spectacular sunsets and warm tropical breeze-filled nights. 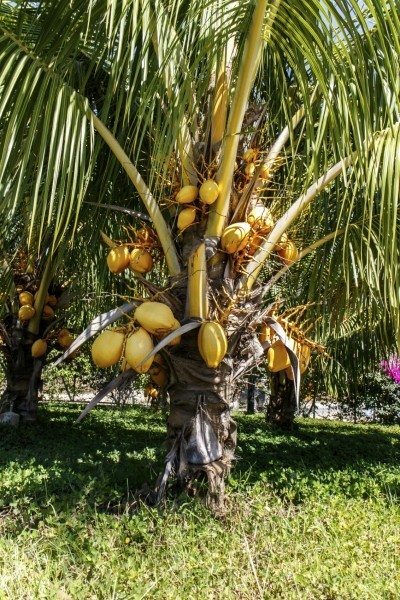 With proper care, a coconut palm tree will produce 50 to 200 fruit per year for up to 80 years, so learning about fertilizing coconut palm trees is of paramount importance for the longevity of the tree. Let’s explore how to fertilize coconut palm trees. The coconut is the most important palm economically. It is the most widely grown and used nut in the world, utilized for its copra – which is the source of coconut oil used to make everything from soaps, shampoos and cosmetics to a myriad of food stuffs. The trees can be propagated from seed, a coconut, but are generally purchased as young palms from a nursery. An interesting note, the coconut fruit can float for long distances in the ocean and still germinate once it has been washed ashore. Although coconut palms are often found along tropical, sandy shorelines and tolerate salt spray and brackish soil, salt is not a necessary fertilizer for coconut trees. In fact, it has no bearing on how well the trees grow at all. Coconut palms grow well in a variety of soils as long as it is well draining. They do need an average temp of 72 degrees F. (22 C.) and annual rainfall of 30-50 inches. Fertilization of coconuts is often necessary in the home landscape. These palms are at risk to nitrogen deficiency, which is characterized by yellowing of the oldest leaves to the entire canopy. They are also susceptible to potassium deficiency, which begins to appear as necrotic spotting on the oldest leaves increasing to affect leaflet tips and, in severe cases, the trunk is affected. Sulfur coated potassium sulfate is broadcast under the canopy at the rate of 1.5 lbs/100 square feet of canopy area four times per year to prevent the deficiency. Palms may also be deficient in magnesium, manganese, or boron. It’s important to fertilize coconut palms at several stages during their growth to thwart or combat potential mineral deficiencies. Fertilizing of coconut trees varies depending on its particular growth stage. The large green leaves of the coconut palm need extra nitrogen. A granular fertilizer with a 2-1-1 ratio should be used that contains both slow-releasing and fast-releasing nitrogen. The quick release will give the palm a fast boost of nitrogen to stimulate growth while the slow release gives gradual nitrogen to the developing roots. There are specific palm fertilizers that can be used or a combination can be applied at the time of transplant. They are generally combined but may need the addition of a wetting agent to help the fertilizer get past the waxy coating of the palm trees where it can be absorbed. If the fertilizer doesn’t contain a wetting agent, add three to five drops of liquid detergent to every gallon of mix. Foliar fertilizer for young coconut trees should be applied when the weather will be dry for 24 hours. Apply at regular intervals every one to three months, monthly seems to be preferable. 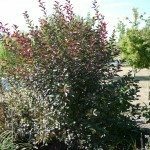 After the first year, the foliar fertilizer can be discontinued. Granular applications are adequate and should still be used at the ratio of 2-1-1 but can now be done every three to four months.